Don’t let another Sturgis Black Hills Rally pass you by. It’s time to make your own memories and leave your mark on the greatest motorcycle rally in the world! It is difficult for some to think about today’s ride because Sturgis is waiting just 242 short miles away, however, our ride is just as good as the destination. We’ll turn east and cross the vast expanse of the Thunder Basin National Grassland, 572,000 acres of lush rolling grass hills and flatlands that were once home to great Buffalo herds. As we wind down our ride for the day we enter the Black Hills National Forest. The name “Black Hills” comes from the Lakota words Paha Sapa, which mean “hills that are black.” Soak in the warm sun and the mystique of the “Paha Sapa”, a place so rich in Native American and U.S. history that you almost feel like you are stepping back in time. Let’s shake off the dust from our first evening in Sturgis and go for a ride. There are a multitude of day ride opportunities to choose from. You can take in one of the organized trips, venture off on your own, or simply take the short trip back to downtown Sturgis to take in all that is Sturgis. We’ll sleep in just a bit and hit the road late morning after a nice breakfast. 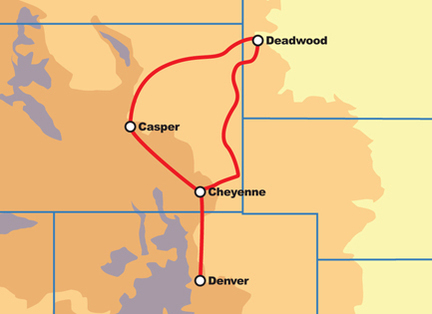 The good news is we will start the journey to Cheyanne with one last trip through the Black Hills of South Dakota. The ride to Cheyanne is as beautiful as any of the day trips we have enjoyed over the past four days. Tonight we will enjoy some true cowboy hospitality and some of the finest steaks in Montana. Thanks for a great Sturgis Tour, and we will see you all on next year’s adventure!